Whether you wax, thread or pluck, stray hairs always seem to crop up at the least opportune times. Is this beauty chick right or is she right? Luckily, the Tweezerman Petite Tweezer Set is there to keep those unwanted strays at bay. Small enough to fit in even the tiniest handbag -- yes, even those ridiculous swan purses from Judith Leiber would fit them! 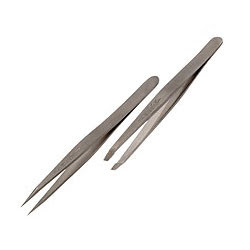 -- this duo of tweezers will help you pluck and tweeze to your heart's content. The set contains one slanted tweezer for your general, every day tweezing practices, and one tweezer with ultra-fine pointed ends to really get in there and yank out the stubbornest, most miniscule of hairs! Best of all, each pair is crafted of durable, substantial stainless steel so they'll really last a long time. The combo is available for $25 on Sephora's website -- quite a bargain when the ordinary Tweezerman tweezer is $20! So what are you waiting for? Those pesky hairs won't pluck themselves!